Even though online slot gaming has gone to over the sky in terms of popularity but it is still best remembered for its progressive jackpots which can make anyone millionaire in few seconds. Even though most of the slots we have in contemporary casinos today lack progressive pool yet they are popular coz they offer a descent prize at fraction of cost, but progressive jackpot games still have a vast fans following hence they are still among the most revenue generated variants for developers. Major Millions is one such online video slot which is rich in features and highly rewarding for its progressive pool that keeps increasing and often rewards much more than other progressive slots. Actually, if you want to know about the popularity of any progressive slot, check its progressive triggers and whichever offers highest amount, means, it is surging at a faster rate which further means more and more players are contributing towards its pool via their bets. 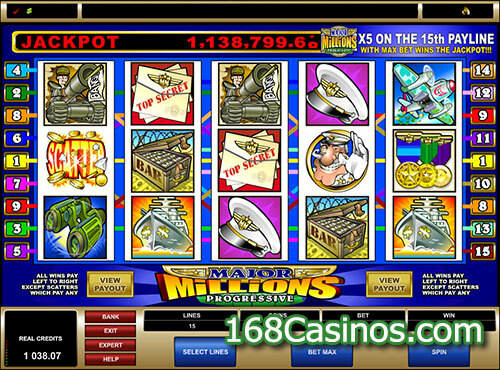 Major Millions holds high in this criterion hence this is one of the most look after Microgaming online slot variants. 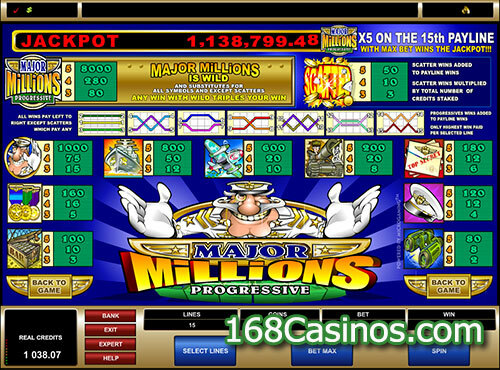 Major Millions 5 Reel Progressive Slot is precisely a five reels online slot that offers a fifteen paylines betting option and its betting range also not very high as you can wager from £0.20 to £3.00 per spin and yes it does not have other features like wild symbols, scatter support, or even a bonus round, so play it only for its progressive jackpot if you believe you are the luckiest guy in the world! Game symbols are designed using two dimensional graphics which look little bit basic but since this is a classic slot, they do the job and match to the theme. The most important part of the screen is the top most row that contains the live progressive pool information and it increases at a faster rate than other progressive slots. Background looks like to be the abstract image with vibrant blue color all over and reel matrix is also accompanied by the reels number on both left and right sides. Bottom area is, like always, the main navigational area which has all the information about your current bet and how much you have won. Overall, its audio visuals are not very impressive and since this is completely a different level slot game that is only played for one particular progression pool, any shortcoming can be forgiven until players are winning tones of money. As told, Major Millions 5 Reel Progressive Slot lacks popular contemporary features like wild symbols – that could replace other game symbols and help you complete a winning combination – and scatter option, although it has the wild one but its only job is to trigger the progressive pool that too only if you have it on fifteen payline which means to qualify for the progressive winning you must bet on all the paylines.